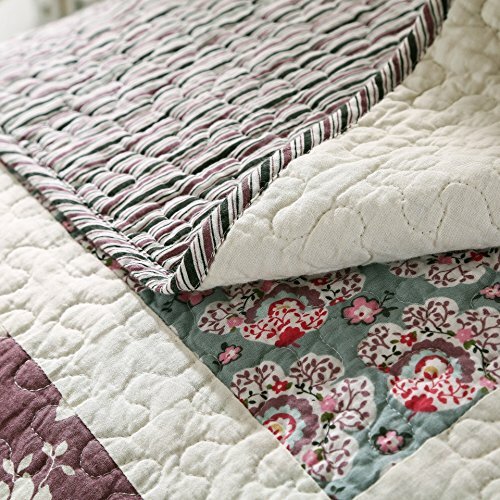 Size:Twin Enjoy the vibrant Multi colorful shades of olive green, Reddish burgundy, light blue and white all across the quilt with added floral and striped detailing. 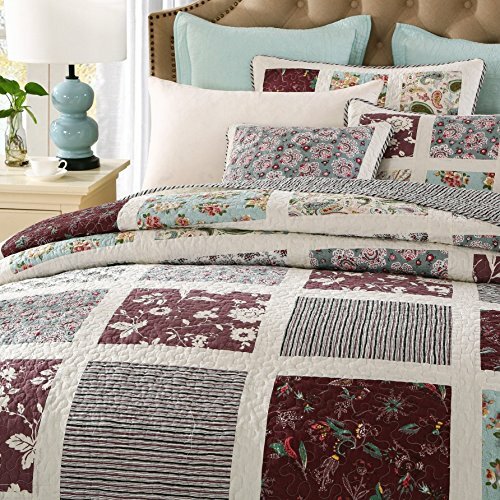 Accented with a variety of different floral designs and bordered motifs to give it a modernly beautiful look with our burgundy quilt bedspread set sold exclusively by DaDa Bedding Collection. To complete the look, it is finished off with multiple squared patterns in various bright and colorful shades across the bed. 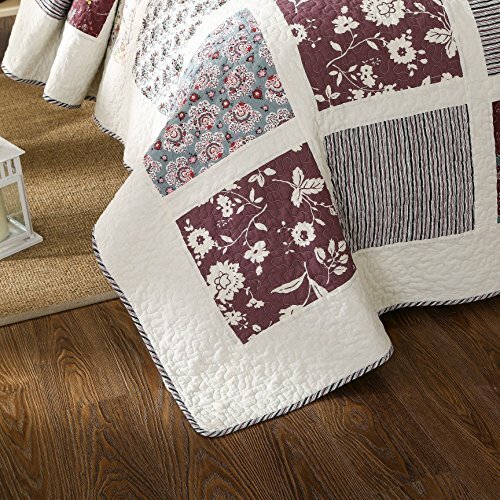 The backside of the quilt is a striped pattern of green and burgundy identical to the pattern that goes along the border of the quilt. 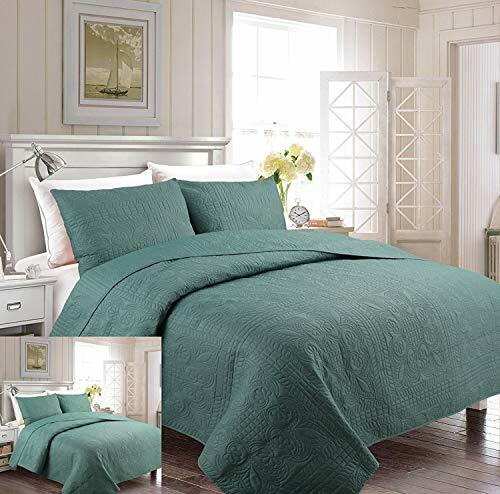 Made with polyester microfiber and contains 50Percent cotton and 50Percent polyester filling created for your comfort for the softest and coziest material. Features: • available in Twin, full, queen, king & Cal king. 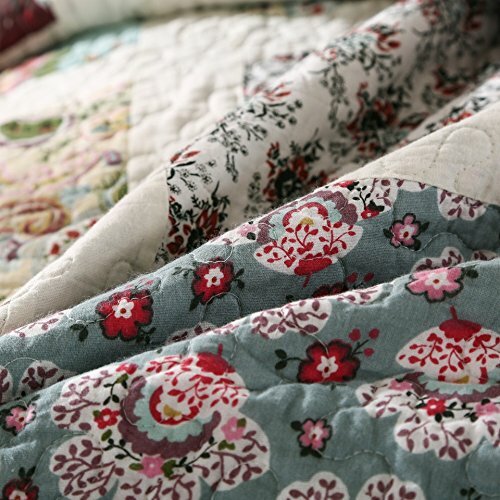 • Twin size set - includes one quilt and one standard sized sham case • full size set - includes one quilt and two standard sized shams cases • queen size set - includes one quilt and two queen sized shams cases • king/Cal king size set - includes one quilt and two king sized shams cases • ideal & perfect for the warmer spring, summer and even autumn seasons! 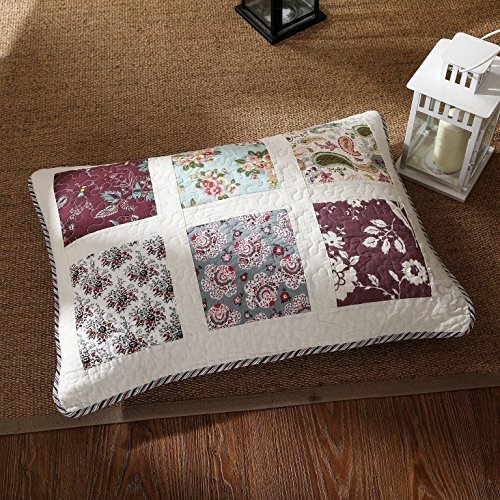 • pattern: patchwork • brand: DaDa Bedding Collection • made in China • matching square cushion covers/accent pillow cases are sold separately! 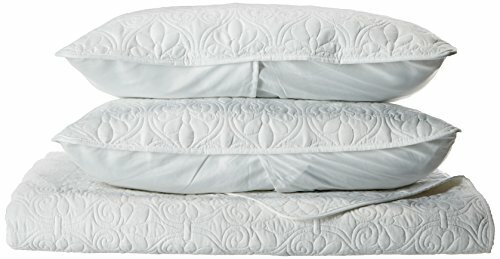 dimensions: Twin size set - quilt: 70 inch x 90 inch & 1 pc standard sham case - 20 inch x 26 inch full size set - quilt: 86 inch x 90 inch & 2 pc standard sham case - 20 inch x 26 inch queen size set - quilt: 95 inch x 95 inch & 2 pc queen sham case - 20 inch x 30 inch king size set - quilt: 108 inch x 100 inch & 2 pc king sham case - 20 inch x 36 inch Cal king size set - quilt: 102 inch x 106 inch & 2 pc king sham case - 20 inch x 36 inch material: fabric - cotton filling - 50Percent cotton - 50Percent polyester washing care instructions: machine wash cold, do not bleach, tumble dry in low cycle & remove promptly.